"This is a hearty, filling, cold-weather soup that makes a meal served with a crusty bread and light salad. The soup is just not the same if the brats are not grilled." Grill bratwursts until cooked through, about 5 minutes per side. Cool. Slice each bratwurst into 1/4-inch pieces. Heat olive oil in a large pot over medium-high heat. Cook and stir onion, carrots, and celery in hot oil until onions are tender, 5 to 8 minutes. Stir garlic into onion mixture and cook until garlic is fragrant, 1 minute. Stir chicken broth, tomatoes, sliced bratwurst, basil, parsley, thyme, and cayenne pepper into onion mixture. Bring to a boil, reduce heat to low, cover, and simmer for 20 minutes. Mix potatoes into bratwurst mixture, bring to a boil, reduce heat to low and simmer until potatoes are almost cooked through, 15 minutes. Stir beans and spinach into pot; simmer until heated through and potatoes are done, 5 to 10 minutes. Delicious. Next time I'll add more sausage. Don't be afraid of that cayenne - it looks like a lot but it's just the right amount for this big quantity of soup. 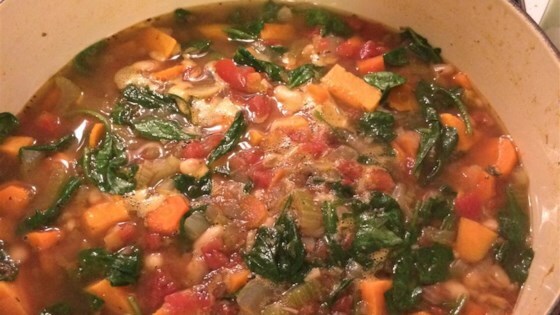 Really hearty and full of vegetables! I had some left over sauerkraut so I threw that in too! Great recipe made it on a larger scale at my work at a cafeteria kids loved it!! This was so good and flavorful that the whole family ate it up and loved it! Didn't have all the fresh herbs, so I just used dried ones & it worked just fine. Highly recommended this recipe, made as is. Family said it was awesome.